The Harbour and Bay View Towers are conveniently located next to the Sanibel Harbour Marriott Resort & Spa overlooking the Sanibel and Captiva Islands. Distinctive among Sanibel Harbour luxury resorts, The Marriott Resort & Spa has a relaxed atmosphere with six distinctive restaurants and lounges to choose from; a Spa and Salon for Health, Relaxation, and Rejuvenation; Expansive Fitness Facility and Tennis Courts and Instruction available. Guest Pass Fee: Visit the Spa Reception Staff at the first floor Spa reception desk for package options and pricing. The Guest Pass is purchased while on property and at The Spa reception front desk. The Sanibel Harbour Marriott Resort & Spa restaurants and spa are available to the public and by reservation. These amenities do not require a Marriott Guest Pass to enjoy. *Resort Harbour Properties is not affiliated with the Marriott and does not operate any of the Marriott facilities. Terms, Rates, and Hours of operations subject to change without notice and some exclusions may apply. Pass subject to Blackout dates without prior notice. Fitness Faculties available to individuals 16 years and older. For tranquility, serenity and total relaxation of the mind, body and spirit, make sure you don’t miss out on utilizing the Spa at Marriot Sanibel Harbour Resort. Featured treatments combine beneficial elements of the sea, leaving you rejuvenated and refreshed. Choose from a variety of pampering sessions or take part in a fitness class led by top professional trainers in the area. 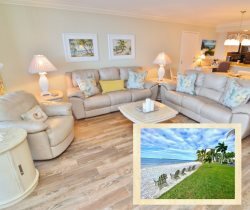 Between the plethora of spa treatments, fitness classes, brand new fitness center, indoor pool, women’s/men’s whirlpools, saunas, steam rooms, showers, lounges, and tennis courts available, there’s no shortage of opportunities for rest and relaxation at our Sanibel Harbour condo rentals! * *Spa use requires fee. Located adjacent to the Spa & Fitness Center, you’ll have convenient access to five clay tennis courts, lighted for night play, with activities for everyone from the novice to the experienced player! With Sanibel Harbour’s very own tennis pro and USPTA- and USPTR-certifies instructors, you can take part in a Tennis Stroke Clinic, Kid’s Tennis Clinic, Hitting Sessions, and Private or Group instruction. Racquet rentals available. Phone: (239)466–2156 - Call the Spa for information or to book a tennis service. If you should need internet access, a printer or other business services, the Marriott hotel's Business Center is open 24 hours per day, 7 days per week (certain hours staffed & fees apply) and located on the second floor of the hotel tower. Sizzling steaks and chops, and over 1,000 bottles of wine. The elite among steaks, Certified Angus Beef® is proudly featured at Courtside Steakhouse. All your favorite cuts of beef are here, along with thick pork chops, rack of lamb, an array of specialty entrees and seafood selections. Complementing them all is a classic collection of appetizers, soups, salads and sides. And there’s sure to be the perfect wine pairing for your meal in our 1,200-bottle cellar. It’s all about the views! Whether you’re seated inside around the polished wooden bar or outside with a warm Gulf Coast breeze caressing your face, the water views at Charley’s are simply spectacular. That’s all the better to enjoy Charley’s signature martinis and local favorite cocktails, plus delicious tapas, brick oven-baked flatbreads and late night menu selections. Conveniently located just off the hotel lobby, Palm Court Bakery offers Starbucks coffee and teas, juices and specialty drinks, delicious pastries, fruit, Haagen-Dazs ice cream and desserts. You can take your selections with you or enjoy them at tables on the terrace overlooking the pool. Set sail for a memorable dining experience! Let the 100-foot private luxury yacht carry you away on a relaxing voyage highlighted by delicious cuisine and magnificent views of Florida’s southwest Gulf Coast. Whether you choose our romantic sunset cruise or delightful Sunday brunch cruise you’ll enjoy a lavish buffet complete with several entrees and a tempting selection of desserts. You also have a choice of settings from which to take in the view, the outdoor observation deck or two indoor, air-conditioned salons. A good reason to get out of the pool. With a shimmering pool on one side and beautiful San Carlos Bay on the other, this is an ideal setting for a light meal and a refreshing beverage. Enjoy specialty drinks, beer and wine, plus savory appetizers, crisp salads, plump sandwiches and kids’ meals too. For Hours of Operations or to make reservations, call the Sanibel Harbour Marriott Resort & Spa Dining Reservation at 239-466-2128. Reservations are recommended.